Washington Capitals head back on the road for what will be their longest trip – in both games and distance traveled – so far this season when they head to western Canada for three games. The trip begins with a visit to British Columbia and the Vancouver Canucks on Thursday night. Washington will be looking to notch their first win in regulation time in almost two weeks, since a 5-2 win at New Jersey over the Devils on October 13th. Since that win, the Caps are 1-3-0, their lone win coming in a 4-3 overtime decision at Detroit against the Red Wings last Friday. Vancouver opened their 2017-2018 season with a four-game home stand that was less than successful (1-2-1), and then they went on a five-game road trip that ended with a 1-0 win over the Minnesota Wild on Tuesday night, giving them a 4-1-0 record on their trip. Scoring has been a bit hard to come by for the Canucks, who rank 22nd in scoring offense through Tuesday’s games. Tied at the top of the points ranking is rookie Brock Boeser (2-4-6, minus-1). A former first round draft pick of the Canucks (23rd overall in 2015) out of the University of North Dakota, Boeser, who appeared in nine games in 2016-2017 in his first NHL tour, is tied for seventh among rookies in total points. The odd thing about his scoring so far is having it come in losing efforts. The Canucks are just 2-3-0 in games in which he registered a point, 2-0-0 in games in which he was shutout. He also has an odd pattern to his ice time. Vancouver has not won a game in which Boeser skated more than 15 minutes (0-3-0), but they are perfect when he skated less than that (4-0-0). This will be his first chance to face the Capitals. For a 27-year old, defenseman, Michael Del Zotto has been around. Drafted 20th overall by the New York Rangers in 2008, Del Zotto spent parts of five seasons with the Rangers before being traded to the Nashville Predators in January 2014 for Kevin Klein. The following summer he signed as a free agent with the Philadelphia Flyers. After spending three seasons with the Flyers, he signed another free agent deal last summer to arrive in Vancouver, leaving only the Mountain time zone as the one in which he did not call home in his career to date. At the moment, Del Zotto occupies an odd place in the team rankings among defensemen. He leads the group in points (0-5-5), but his minus-3 is worst among that group. He leads them in total shots on goal (23) but has yet to hit the back of the net. Only 11 players in the league (six of them being defensemen) have recorded more shots on goal without having lit the red light. Del Zotto is 2-8-10, plus-3, in 29 career games against the Caps. If the Canucks are going to go with the hot goalie, it is hard to figure out which one to go with on the heels of their three game winning streak coming into this contest. Jacob Markstrom stopped 40 of 43 shots (.930 save percentage) in wins over the Buffalo Sabres and Detroit Red Wings. Then, Anders Nilsson went Markstrom one better, stopping all 29 shots he faced from the Minnesota Wild in a 1-0 shutout on Tuesday night. Markstrom has had more chances this season, appearing in seven games to Nilsson’s three, but Nilsson has the better numbers – a 1.84 goals against average to Markstrom’s 2.48 and a .949 save percentage to Markstrom’s .908. It is an interesting goaltending situation for the Canucks. Both natives of Sweden got their starts with other franchises (Markstrom drafted by Florida in 2008, Nilsson drafted by the New York Islanders in 2009, both are of the generation of tall goaltenders (both are 6’6”), neither have ever appeared in as many as half of their team’s games in any season (Markstrom appeared in 33 games with the Canucks in 2015-2016, Nilsson in 26 games with Edmonton in 2015-2016 and with Buffalo last season). This could be a season-long battle to see who emerges as the team’s number one netminder. Markstrom is 0-5-0, 3.51, .889 in five career appearances against the Caps, while Nilsson is 0-3-1, 3.64, .882 in six appearances against Washington. 1. The difference between the home and road portions of the Canucks’ season had been in scoring defense. In their four home games to open the season they allowed an average of 3.25 goals per game. On the road, that number is 1.80 goals per game, and they have two shutouts. 2. Vancouver is 30th of 31 teams in credited hits with 137 (Carolina has 105). The also rank 27th in the league in blocked shots (108). If there was a “grittership index” of hits plus blocked shots per game, Vancouver would rank 30th of 31 teams with a 27.22 rating (Carolina is at 27.14). 3. The Caps might be able to jump on the Canucks early. Only three teams have allowed more first period goals through Tuesday’s games than Vancouver (11). And perhaps they had better. The Canucks have allowed only 11 total goals over the last two periods of games. 4. Vancouver has an interesting and, perhaps for them, troubling shot attempts profile. They rank just 26th in the league in shot attempts-for percentage when ahead in games (42.86), but they are eighth in the league in shot attempts-for percentage when behind (58.08). They always seem to be playing to regress to a mean. This might be true for most teams, but it seems exaggerated with Vancouver. 5. The Canucks have at least spread their scoring around. Of the 21 skaters to dress this season, 19 of them have at least one point on their ledger. Only defensemen Alex Biega (in two games) and Erik Gudbranson (in eight games) have yet to record a point. 1. The Caps are 4-1-0 when Alex Ovechkin scores at least one goal, 0-3-1 when he doesn’t. 2. John Carlson is second in the league in average ice time, averaging 26:43 per game. Only Buffalo defenseman Rasmus Ristolainen is logging more – 27:39 per game. 3. Only nine players in the league have logged more total shorthanded ice time than Jay Beagle (35:21 in nine games). All of them are defensemen. In fact, Beagle is the only forward in the top 19 in total shorthanded ice time. 4. Brooks Orpik is back among the leaders in credited hits. He is tied for fifth with 30 and is fourth among defensemen. 5. Another random John Carlson fact…through Tuesday’s games, no player in the league recorded more shots on goal without scoring one than Carlson (34). And now, they are the grand old men. Daniel and Henrik Sedin are the oldest players on the Vancouver roster, Henrik the older by six minutes. They are first, second, or first and second in every meaningful franchise ranking: games (Henrik: 1,257; Daniel: 1,234); goals (Daniel: 372/1st); assists (Henrik: 786; Daniel: 618); points (Henrik: 1,023; Daniel: 990); plus/minus (Henrik: plus-185; Daniel: plus-166); game-winning goals (Daniel: 82); power play goals (Daniel: 130); total minutes played (Henrik: 22,127; Daniel: 21102); and on and on. But now, with both of them at the age of 37 and in the last year of their respective contracts, one wonders if this will be their last season with the Canucks. There has been comment on their perhaps stalling a youth movement with the club. Add to this that the twins are off to something of a slow start scoring-wise (Henrik has one point in his last seven games; Daniel has a goal and an assist in his last six contests) and are near the bottom of the team’s plus-minus rankings, and the end seems not to be over the horizon any longer. Daniel is 7-6-13, plus-3, in 18 career games against the Caps, while Henrik is 3-11-14, plus-2, in 19 career games against Washington. One of the things one might watch for with young players with offensive skills is streakiness. So far this season, Jakub Vrana has been streaky in an almost metronomic way, if that makes sense. He had points in his first two games, went without one for a pair, then had points in two more. He continued the pattern with another pair of games without a point, but when he went without one in the 4-1 loss to the Florida Panthers last weekend, it extended his streak without a point to three games. He also came within one second of logging his lowest ice time of the season (12:07; he has 12:06 in the Caps’ 5-2 win over New Jersey on October 13th). The ice time has a bit of the canary in a coal mine character to it. The Caps are 3-1-0 in games in which he skated more than 14 minutes, 1-3-1 when he skated less than 13 minutes. Oddly enough, both of his goals so far were in games in which he skated less than 13 minutes. And perhaps odder still, he is 2-2-4, plus-1, in road games, while he is 0-1-1, plus-2, at Capital One Arena. He is without a point in his only career appearance against the Canucks. The western Canada trip is often one with which the Caps have difficulty. However, last season the Caps went 3-1-0 on their trip, beating Vancouver, Calgary, and Winnipeg after dropping the first game of their trip. This time around the Caps do not get Winnipeg on the trip, but what they will be getting is three surprising teams. Vancouver (5-3-1) and Calgary (5-4-0) are perhaps doing better than expected in the early going, while the Oilers (2-5-1) are underperforming. What the Caps will be getting on this trip is, oddly enough, a chance to break out of their offensive doldrums. Vancouver, Edmonton, and Calgary are among the dozen worst teams in the league in goals allowed on home ice. 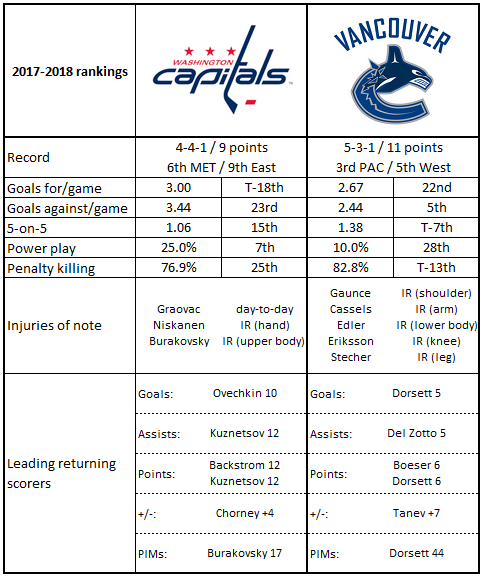 In this contest, Vancouver returns home after a long road trip, but with neither Canuck goaltender having any great success against the Caps over their respective careers, Washington might just be able to ruin the home cooking.